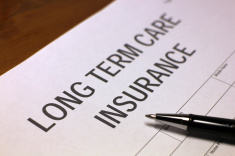 Long Term Care Insurance offers coverage for skilled care that is provided when recovering from an illness, an injury, or elderly needs. Personal care helps maintain the daily activities and functions of life. Long-term care is usually not medical care and generally does not require a doctor or a nurse. More than half of the U.S. population will require long-term care at some point in their lives, due to the fact that we are living longer. With limited benefits, it is important to note that Medicare and Medicaid do not provide sufficient long term care insurance coverage. When someone requires long-term care, it is not just an emotional strain but a financial one as well, impacting retirement savings and overall financial position. Long-term policies provide peace of mind for you and protect both you and your loved ones from emotional, physical and financial strain. CONTACT US TODAY IF YOU ARE INTERESTED IN MORE INFORMATION AND A QUOTE ON LONG-TERM CARE INSURANCE. CLICK TO CALL OR FILL OUT THE FORM BELOW TO REQUEST ASSISTANCE.